I've already read Vol. 2 so once again I'm playing catch-up. Vol. 2 didn't impress me much so I wasn't expecting great things here but I was mistaken. I really enjoyed this book. This is the first time I've read Flash where so much of his time is spent at his day job, forensics. 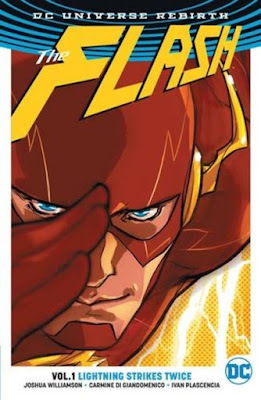 Barry Allen, my favourite Flash, was the main focus throughout with a small visit from the Wally West Flash and the story of how the new Kid Flash Wally West got his powers. There are a couple of stories going on with different villains and both are very exciting. I loved the art and now that I've read Vol. 1 it has cleared up issues from Vol. 2 that I had problems with. I'm very interested now at seeing where the storyline goes with Vol. 3.